The daily commute is an unfortunate yet inescapable reality for most of us, and yet it feels oddly stuck in the past. In the US alone, Americans took 10.4 billion trips on public transport in 2016, according to the American Public Transportation Association. That amounts to 35 million times every weekday - so why, in the bold age of the smartphone and wearables, are many of us still tapping our pre-paid cards and swiping our paper tickets? Isn't it about time for public transportation, a vital artery in how people live and work, to catch up? There are already a few countries in the world that are ahead of the game. Singapore has a contactless payment system that even lets you link your Garmin fitness tracker to your transportat payments via EZ-Link. But are they the exception, or the start of a new trend? While many public transportation systems in Asia and Europe have already modernized their infrastructure for a wearable future, American public transportation systems have taken a little longer. Part of that is down to bureaucracy with transport institutions waiting for contracts to expire so they can move to a more modern alternative. The other part of that is due to Americans not being as well versed in contactless payments, which have thus far been more popular in Australia, Europe and Asia. 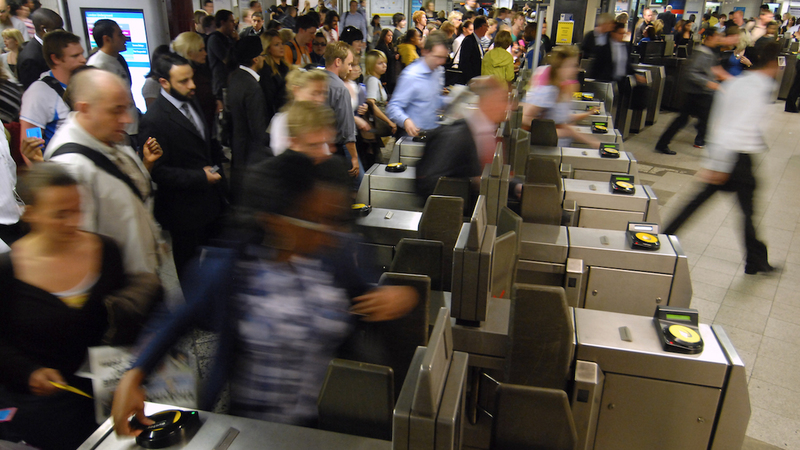 In the UK, Transport for London has made bigger steps to embrace a wearable era. When it started planning for a contactless payment system back in 2007, it knew it needed to plan for wearables and mobile devices in the future. It also had the Oyster card, which allowed it to publicize contactless payments in the mind of Londoners for about a decade. Transport for London's public transportation system, which utilizes an account-based system, allows riders to pay with whatever system they desire. They can use the closed, proprietary Oyster card system if they choose, but they can also use Android Pay, Apple Pay or Samsung Pay on their wearable or smartphone. Barclaycard's bPay also offers contactless payments on the underground. The account-based payment systems eradicate help eradicate the many ills of current public transportation payment systems. Jonathan Hill, product manager for contactless payments at Transport for London, points out that when you wander into almost any shop things are simple because you have your payment. You ask for what you want and then pay for it. There is no middle step where you have to buy a card, load it up with money and then buy your items (which is why putting a digital Oyster card on your smartwatch probably wouldn't make much sense). However, that step still exists in many public transportation systems. "We wanted to take that away because London is a very large, global city," Hill says. "We have a transit population, we have a lot of visitors and a lot of time and energy is wasted figuring out which ticket to purchase in advance, queuing up to load the ticket, loading credit, topping up cards, all of that doesn't need to happen if you have an open loop card already in your wallet." And that means features that ease the trials of public transportation. For example, if you use Android Pay in conjunction with Transport for London's services, you can get a map of where you paid for your fares. If you, for example, forgot to tap out - incurring a maximum charge on your account because the system things you're trying to fraud it - you'll receive a notification and a link showing you how to correct the issue. No fuming about and searching for a customer service number, or yelling at an employee entrapped in a glass and metal box. Hill says because these systems handle fare calculations and data management on servers rather than at the point of entry, they're capable of computing more complex payment structures, which will allow public transportation companies and services to get more ambitious in ticketing offers. Things like capping, which automatically makes sure you aren't overcharged for multiple trips daily. For example, if you make three trips during a day and the fares for those three trips equals the amount you'd pay for a day pass, it automatically won't charge you for the rest of the day. London's system has become a model for a modern, wearable-friendly infrastructure. Over in Chicago you'll find a next-generation public transportation payment system built by Cubic Transportation Systems called Ventra. The system is versatile and similar to London's, a system that has become the envy of most major cities in the world, according to Hill. In fact, Cubic has licensed Transport for London's technology to roll it out in more cities. Cubic has even teamed up with Transport for London to pitch a plan to modernize New York City's public transportation wearable system. Following in London's footsteps may not be such a bad idea. Hill says in early 2016 3% of its contactless payments were done on mobile and wearables. Now, it's 10%. "It's a growing portion of a growing market." Bay Area Rapid Transit (BART), the San Francisco Bay Area's subway system, currently uses a contactless payment system called the Clipper card, which works by users tapping in and out on their journey. Simple, but increasingly outdated. BART is required to use the Clipper card by the Metro Transportation Commission (MTC) and the goal is to unify the public transportation options in the Bay Area; if one mode of travel is using the Clipper card, they all have to use the Clipper card. The only opportunity to modernize comes when it's time to agree on a new contract, like when the current Clipper contract runs out in 2019. John Yen, division manager for fare collection engineering at BART, tells Wareable that work on a next-generation version of Clipper, simply called Clipper 2.0, is already in progress. "It is intended for that system to utilize what is called an account-based strategy," he says. So rather than use a closed, proprietary system where you have to top up a card, you'd be able to pay however you want. Apple Pay, Android Pay, Samsung Pay, whatever pay. You tap your phone or smartwatch to the sensor and you're good to go. If you can't wait that long, you could always try what this guy did by turning the current Clipper card into a wearable. For now, as mobile payments pick up speed, transport companies are starting to catch up. During the 2016 Rio Olympic Games, Gemalto partnered with RioCard on a transport ticketing wearable to help citizens and visitors get around with ease. Gemalto said the pilot was a success, and the more we see of these types of projects, the more confidence transport authorities will have to start implementing similar systems. There are plenty of other avenues to explore in this space. What opportunity will smart clothes offer for our daily commute? Will our future smartglasses scan us in and out of the train station using some type of retina detection? Also interesting is to think how fitness trackers and smartwatches might even one day harness your travel information, giving out a gentle nudge as you approach the underground and telling you to consider walking home to burn off those extra calories leftover from lunch. For now, things have started to change, and there's no doubt that the future of transport is wearable.